So in the northeast state of Manipur there were these monks from the International Society for Krishna Consciousness, aka ISKCON, aka the Hare Krishnas. They were minding their own business selling books, until a possibly drunk jerk comes up and says "Hare Rama, Hare Krishna, beef is the best" five times, a blasphemous take-off on the famous Hare Krishna chant. There was a "heated exchange," some sort of scuffle, and undoubtedly hurt feelings all round. But it didn't end there. One monk, who had his clothes torn, filed a First Information Report (FIR, or police report), saying that the man had violated Section 295A, the national law that says that anyone "with deliberate and malicious intention of outraging the religious feelings of any class of [citizens of India], [by words, either spoken or written, or by signs or by visible representations or otherwise], insults or attempts to insult the religion or the religious beliefs of that class, shall be punished with imprisonment of either description for a term which may extend to [three years], or with fine, or with both." Interestingly, the monk didn't file any charge about the assault by the old man's associates. I don't agree with this extremely broad law, which obviously can be easily used for all sorts of ends that are bad for Indian society. But let's leave that aside. Wouldn't it have been better if instead of giving the guy some sweets the monks had just decided to not press for charges in the first place? Just because a law's on the books hardly means it needs to be enforced in all cases. I'm certain the monks were insulted, but couldn't they have just let it pass them by? How is spending time in jail likely to make Joykumar think any better about the monks, or any worse about eating a burger? 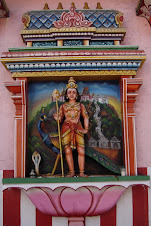 BTW have you been to the ISKON temple in Bangalore? It is in Mahalakshmi Layout on the Chord road. And yes, I went to the ISKCON temple here just a couple months ago. It was crowded, but the impressive thing was how many more people the facility could handle. Only bad parts were that the animatronics were shut down (I think they were getting ready for a major Krishna festival the next day)---and then I got lost heading back to the place where my shoes were! John, I agree - In the wrong hands it could wreak havoc. The law is only as good as the enforcer - unfortunately in India we know what kind get to enforce it. Also I think people should loosen up in India about making fun of religion - they take it way too seriously I remember when I was studying in Mysore there was a large scale riot (people lost lives) because a newspaper ran a short story called "Muhammad the idiot" - it had nothing to do with religion - the village idiot happened to be called muhammad ! BTW I didn't know about the animatronics! I ddn't see any during my last visit must check it out the next time I get to visit. The only kind I got to see was being done by Humans (not sure if you were implying them 8^) ).